When Ruben M. Escobedo (B.B.A. ’60) was a student at St. Mary’s, he often turned to Assumption Chapel in Reinbolt Hall for a place to reflect. Now this Trustee (and former Chairman of the Board) and his wife, Veronica, have generously supported the recent renovation of that very space through The Ruben M. Escobedo and Veronica Salazar Escobedo Charitable Fund of the San Antonio Area Foundation. 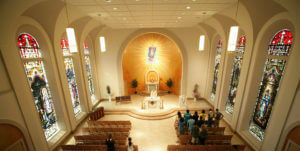 The chapel, which was built in 1908, has been rearranged, reorganized and renovated throughout the past century. But in each of its many incarnations, it has remained a seat of spirituality and community on campus—for St. Mary’s students, the campus, and the city at large. “The chapel is right at the heart of the University, as it should be,” says the Rev. Rudy Vela, S.M., D.Min., vice president for Mission and Identity. 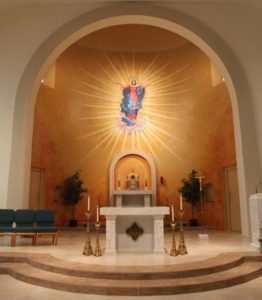 The Marianist community was instrumental in helping make the vision of the new chapel a reality. During the latest renovation of Assumption Chapel, a bronze figure of Blessed William Joseph Chaminade, founder of the Society of Mary, was created by Brother Joseph Aspell, S.M., who was commissioned by the U.S. Province of the Society of Mary to sculpt Chaminade in celebration of the 250th anniversary of the founder’s birth. Brother Earl Leistikow, S.M., Director of the Marianist Archives at St. Mary’s, loaned four brass and alabaster altar candlesticks to Assumption Chapel that came originally from Maryhurst in Kirkwood, Mo., the headquarters from 1921 to 1969 for St. Louis Province superiors and candidates. The shrine shelf for the Sacred Heart of Jesus, located in the apse of the chapel, was built by Brother Tom Suda, S.M., especially for the renovated chapel. The General Administration of the Society of Mary headquartered in Rome donated the rare yellow marble tabernacle and candelabras. This article originally appeared in the Fall 2011 issue of Gold & Blue magazine.